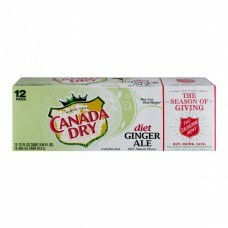 Provider: Dr Pepper/Seven Up, Inc.
Canada Dry® Diet Ginger Ale. Since 1904. Made from real ginger. 100% Natural flavors. Caffeine free. The season of giving. The Salvation Army®. Buy. Drink. Give. Every purchase is a donation to The Salvation Army. 12 pack. 12-12 fl oz cans (144 fl oz). 12-355ml cans (4.3 L). No calories. Caffeine free. Consumer comments? 1-866-SAY-CDRY. canadadry.com. Manufactured under the authority of Dr Pepper/Seven Up, Inc. See unit container fur manufacturer's identity. Canada dry is a registered trademark of Dr Pepper/Seven Up, Inc. Please recycle. Canada dry diet ginger ale has a crisp, refreshing taste because it's made with 100% Natural flavors, including real ginger. ©2016 Dr Pepper/Seven Up, Inc.